It is frightening to hear the words you have cancer or in the case of those with advanced disease, we have run out of treatment options. How can you process this information and move forward? How can you cope with the reality of being in treatment for the rest of your life? Susan G. Komen LA County has taken a leadership role in providing outreach and education to our most vulnerable community, the men and women diagnosed with terminal breast cancer. Whether you call it Stage IV or metastatic disease, there is no cure. From the earliest stages of breast cancer to the more advanced, Komen understands the unique and difficult issues confronting anyone who has been touched by cancer. The Living with Metastatic Breast Cancer (MBC) initiative aims to address an often underserved population of individuals with stage IV metastatic disease and their caregivers. Our first step towards this goal is hosting a series of educational events and an annual conference called Living with Metastatic Breast Cancer. The Living with Metastatic Breast Cancer series is working to create a community of patients, caregivers and medical professionals to share new information, practical resources and support. With an estimated 155,000+ women currently living with metastatic breast cancer in the United States, Komen LA County is dedicated to understanding and addressing the needs of this growing population. Watch Valynda’s Metastatic Breast Cancer journey. To foster a collaborative community that actively advocates for the needs and voices of all people affected by Metastatic Breast including patients, families, and caregivers. 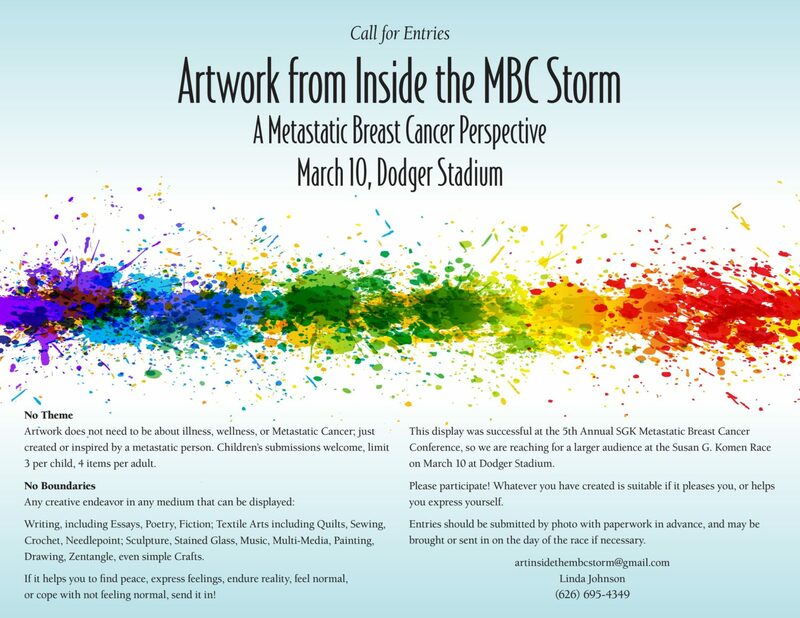 Calling all artists who are living with metastatic breast cancer! Submit your work NOW to be exhibited at the Race for the Cure on March 10th. 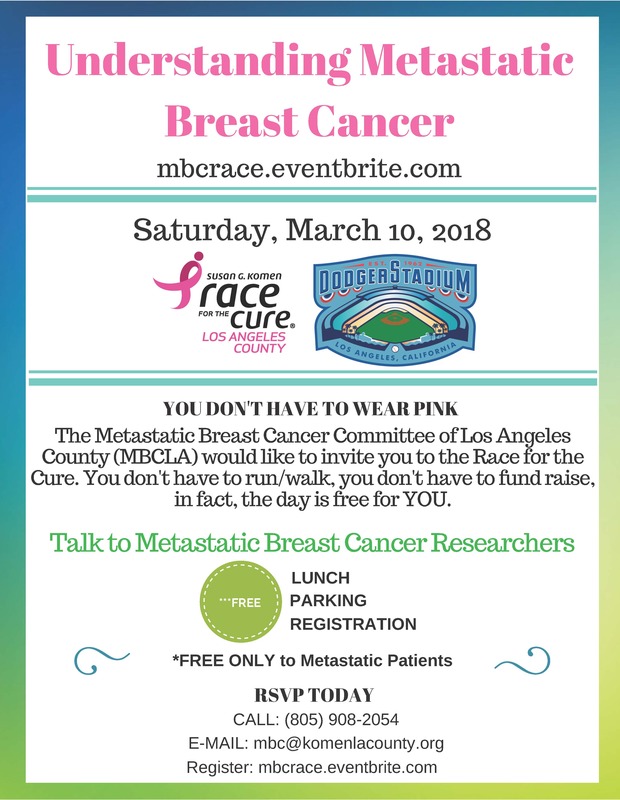 With your support, Susan G. Komen LA County can continue to build the Living with Metastatic Breast Cancer initiative and engage the medical and patient community in this important cause. Check out videos from our 2017 Metastatic Breast Cancer Symposium on Complementary Medicine! Click here for a list of Metastatic Breast Cancer resources from Komen Los Angeles. Click here for a list of Metastatic Breast Cancer resources from our national headquarters. To learn more about this initiative, please call (310) 575-3011 or email MBC@komenlacounty.org.